The president of Huesca reviewed the news talking about the options of his team, the departure of Emilio Vega and his future successor and the future of Francisco as a coach. 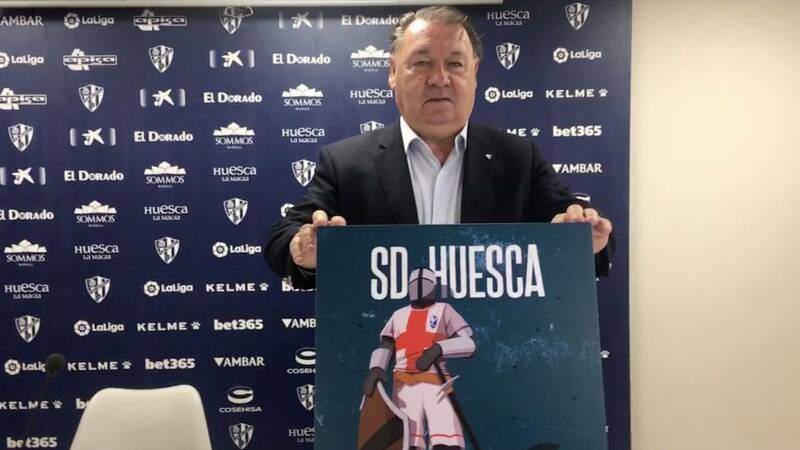 El Huesca needs a miracle to achieve permanence and its president, Agustín Lasaosa, has decided to invoke the patron saint of Aragón, San Jorge, to help the Altoaragoneses to the struggle for permanence. On April 23, the Huesca receive their stadium to Eibar and after the blessing of the Basque team and La Liga, the locals will play with the elastic of the cross and the head of the club asked for an effort to the fans: "We want All the fans come with the T-shirt of the Cross of San Jorge We want to see tiers dyed white to make it a special day ", explained the president. Lasaosa is optimistic about the future of his team in the First Division: "I have my calculations and I sign four points from the next two games because there is a hodgepodge in the lower area that there is no God to clarify, we are the last ones and we have it worse, if we score in Vallecas, the one from Eibar will be an unforgettable day Vallecas's match is important, not decisive, although we are forced to score, the team is not broken, I see them all in. I think that for the game on Saturday the R is more worried ayo that we, "said. El Huesca has begun to work in the next season and the first step was to finalize the contract of Emilio Vega with the Huesca: " The exit with Emilio has been because we had different thoughts and we came to a agreement. We are working on different options and then decisions will be made regarding the future of players and their work team ". Regarding the tenant in the bench of Huesca, Lasaosa has no doubts and once again broke into praise for his current coach: "Francisco is a great coach, I hope he stays, I have great personal and professional esteem, Francisco is the coach of the future for Huesca," sentenced the Barça leader. Roberto Santamaría could not finish the training by a strong blow with the equipment of the team. The Navarrese goalkeeper complained so bitterly that the club's alarms jumped before a possible injury. The goal of 34 years could not finish the session and saw the end of training from the band. The medical services hope that he can return to training as soon as possible and in principle will be in charge of defending the goal of Huesca at the Estadio de Vallecas. Xabi Etxeita ends contract on June 30 with Athletic de Bilbao The center is on loan from the Basque team and from next July will be free to negotiate their future. However, the defender did not want to clarify what his next destination will be: "Well right now I'm thinking about what I have to think that enough time takes away from us." The 31-year-old defender commented.